Jon Hodgson and his boys are at it again: The Forest Dragon Bang & Twang. At least check out the adorable little animation! It's a quick and fun little card game set in the same world as their first game and once again featuring quirky art done by kids. And see my signature for the real kicker. Storage for wargaming minis just kicked off. The funds raised from this Kickstarter will help pay for much of the assembly and the overseas freight on the Recon Black Sergeant. We are also hoping to hit some stretch goals to include some of the new color options, which all require their own MOQs (minimum order quantity). With your help we can bring the new Sergeant v2.0 to market via direct consumer sales and through traditional distribution. In 2016 a small team of games designers, aged 9, 6 and 43 made a card game called The Forest Dragon by Rory Age 9. Two years later, with two awards under their belt, they're back, with Bang & Twang. Dream Pod 9's latest Jovian Wars Tabletop Wargame Kickstarter is live. 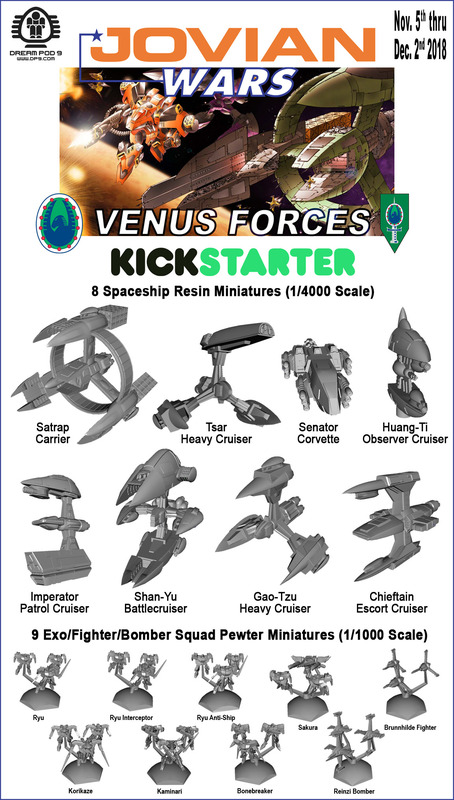 This time we are making new spaceship, exo-armor, and fighter/bomber squad miniatures for the game's Venus faction. The Kickstarter runs to Sunday evening, December 2nd, 2018 at 8 pm EST. 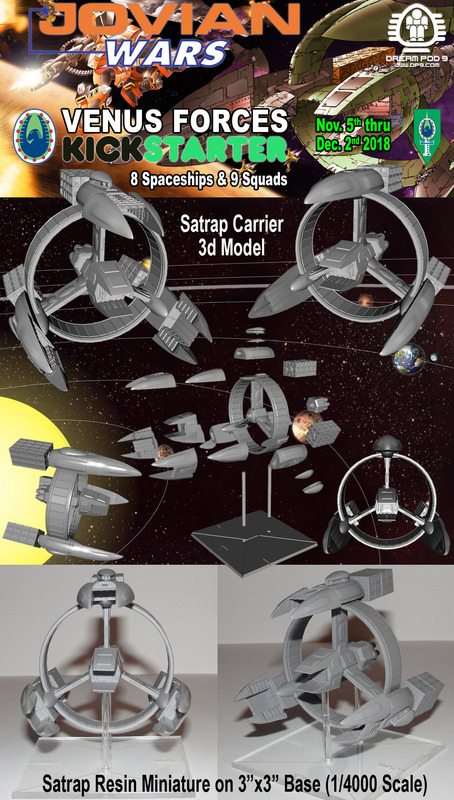 Our initial funding goal is $4,000 CAD, needed to cover the mold costs for the high quality multi-part resin spaceships and give our Backers some great reward packages has already been reached. Now we are working on Stretch Goals to add more weapons and other parts to the various ships. If you love spaceship miniatures please checkout the 8 new spaceships (1/4000 scale) and 9 exo/fighter/bomber squads (1/1000 scale) in the image below. Plus here is an image of the Strap Carrier with different views of the 3d model, exploded parts view, and photos of the actual resin miniature on 3" x 3" acrylic base. The Venus faction don't flaunt their power in the solar system and camouflage their warships as civilian freighters. Hence we have included extra cover plates for weapons and closed hanger sections to make the civilian versions or if you want you can pin the parts and hot swap as desired. You can check it all out at the Kickstarter link below and help us by pledging for one of our great reward levels. Squamous Studios is back at it again with more Feed the Shoggoth! goodness! We released the core card game in 2015 after our successful Kickstarter, and as of today, have launched the KS for the first expansion, which is entitled Morsels of Madness! The expansion will consist of 42 cards, and include new Minions, Artifacts, Spells, and Cult Factions. Also included will be rules summaries for the core game, as well as tips on how to use your new cards. We're really excited about this project, and hope that you'll join us in bringing it to fruition. For those who have not been acquainted with Feed the Shoggoth!, it is a fast and devious Lovecraftian-themed card game for 3-6 players, in which players take the role of various cult leaders attempting to feed lowly Minions from their cult (and thereby earning victory points) to the very angry and very hungry shoggoth roaming around the table. The other cult leaders can attempt to disrupt and sabotage your sacrifice, preventing you from earning the points you need to win the game. But watch out! If you can't complete the sacrifice of your Minion to the shoggoth, it eats you, and you're out of the game! This is the first game materialization in the Ancestral Campaign Setting (Fantasy world in development for about a Decade), it is Dark Themed, highly Tactical and very quick in game play time (10 rounds, min setup needed). So come on and back us! We have great things planned and amazing zombie kills to do.